The Nurse or Matron is able to respond immediately to the exact location that the patient or resident is situated. The notification is wirelessly transmitted to the Nurse or Matron via a Display Panel at the Nurses’ station or a wristwatch which gives off an alert sound and a vibration in case the Nurse is away from the station during a medical emergency. On the way to the patient or resident, the Nurse may also quickly recognize which room to go into via LED lights flashing above the door. Our Wireless Nurse Call Systems will significantly reduce the challenging demands of a Hospital or Retirement Home environment. We all know the struggle that elderly or disabled people have in their everyday lives. It isn’t always easy to get from one place to another and when an accident does occur they might not get the immediate assistance as needed. Imagine the possibility of improved response time, minimal cables and instant notification of an emergency with the push of a button. With BellMe we can offer you all of this and so much more. Our systems are extremely easy to programme and operate. Self Installation is a breeze. Simply mount our call buttons onto a flat surface and you are good to go. BellMe can also set the calling information for you or you can programme each call button easily. If your team would like to modify and adjust the system, BellMe will provide videos so that you can take control, and we will be there to provide support. Enquire with us for more information regarding agents in your area to conduct an on-site inspection and quotation. Your have the freedom to choose a finanical plan that suits your establishment when purchasing our Nurse Call Systems. All BellMe Products can be supplied as once-off purchases or on a monthly rental plan. Your Nurse Call System comes with the basic equipment required for it to run smoothly. For eg: each Call Button is supplied with the mounting bracket even if you only want to use it on a lanyard and all Display Panels come with a Power Supply. We offer technical support, and we are willing to go the extra mile for our customers. You don’t have to be slowed down by any technical aspect of our products. We will provide telephonic or remote login support to you. Our Nurse Call Systems use radio frequency to wirelessly send out a signal or notification. If your internet connection is interrupted your Nurse Call System will continue to work as normal. Have peace of mind that you are not bound to your service provider by a contract. If you wish to enter into a Maintenance Agreement we can provide you with a choice of packages to suit your establishment. The Maintenance Agreement is valid for 12 months with payment made via a debit order. Speak to us for more information. Our systems are more cost-effective than typical wired systems. 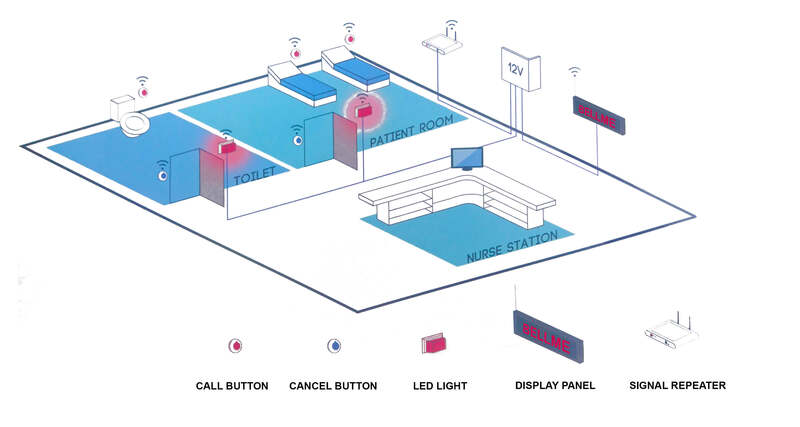 A Wireless Nurse Call System is far more cost effective in a retirement home or hospital since installation is a breeze. Running cables through a beautiful establishment can be a tedious task especially if the retirement home or hospital is spread out. Upgrading a wireless system or moving the nurse call buttons around is fairly quick. Even if you would like to rename call buttons it's a simple 3 step process that takes less than a minute. Your residents can call for assistance from the bathroom, garden, lounge or any other area a resident may occupy. BellMe Call Buttons can be worn on a Lanyard so residents may move around with their button close at hand to call for assistance. Speak to us about boosting your Call Button transmissions to cover any area of your property. whereby entire system runs the risk of being damaged in the event of a lightning strike which is, in most of the cases, where BellMe comes to the rescue. We have also been told about cases where rats chew and damage wires. Another incident experienced with a wired system is that when a check was done on the system they found that one of the wires were cut off and there is no way of knowing how long it has been that way - if something had happened to that resident it would have been really problematic. It is assumed that the fire company must have confused the wire from the wired nurse call system with one of their systems wires and it was cut by mistake without realizing. Our Nurse Calls Systems are Wireless, Reliable and provide Effective Communication between you and your patient or resident. No, BellMe Nurse Call Systems are a once-off purchase and does not tie you into a contract with monthly fees. We do however offer optional Maintenance packages at a monthly fee. Installation cost is dependent on various factors such as your location, system size and method of installation. Please speak to a consultant for more information. BellMe provides you with once-off training on the system upon installation free of charge. We also have YouTube videos available that we can send to you as well as telephonic troubleshoot. If you still need assistance after this, we do have call-out fees. Will our wireless network interfere with the nurse call system or the other way around? No, if you have a wireless infrastructure at your establishment it will not interfere with the nurse call system and vise versa. Our system works on a radio frequency of 433MHz. Are all the call buttons waterproof to mount in the bathroom? Yes, all BellMe buttons are 100% waterproof and can be used in more accident-prone areas such as showers and toilets etc. What is the specs on the wiring? Our system is wireless as the buttons only require batteries and works on a radio frequency. The only wires you need with our system is the power supply of the display panel which we also provide. If your hospital or retirement home is going to make use of the reporting feature you will also require a LAN Cable that needs to be connected from the screen to a computer. We recommend not using a cable longer than 5m to ensure accuracy. Does our system send an SMS when the button is pressed? No, our system sends an alert to your chosen receiver wirelessly and does not link to emergency services. Do we have an intercom system that works with this? No, our wireless nurse call system does not make use of Intercoms. Please speak to a consultant for our Intercom system. Does our alert go to a response team? What does the log sheet of the BellMe Software look like? From the BellMe software you are able to export reports into excel spreadsheets for easy reading and safekeeping. Feel free to contact us directly with you query. We will be glad to assist you!